In recent years, new discourses have emerged to inform the philosophy and pedagogy of early childhood. This collection brings together contributions from leading scholars in early childhood education, and each chapter engages with the critical task of reformulating early childhood education and the philosophy of the child with a specific focus on pedagogy. 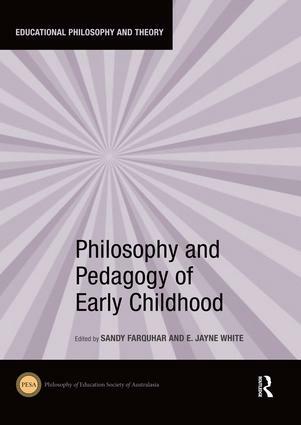 The contributors to Philosophy and Pedagogy of Early Childhood explore pedagogy through a philosophical lens, and discuss themes including intersubjectivity, alterity, ethics, and creative experience. Although these themes are addressed in very different ways, each invokes a call to teachers to consider their own position in the dialogical process of learning, and suggests that pedagogy is necessarily situated, provisional, compositional, and discursive. Such critical and philosophical inquiry is a welcome antidote in an era of pedagogical certainty and standards-based agendas. This book was originally published as a special issue of Educational Philosophy and Theory. Sandy Farquhar is Director of ECE and Senior Lecturer in the Faculty of Education at the University of Auckland, New Zealand. Her main research area is the philosophy of early childhood education and narrative theory. She has published widely in the areas of early childhood and narrative theories, including her book, Ricoeur, identity and early childhood (2010), and two co-edited special issues of Educational Philosophy and Theory on the philosophy of early childhood (2007 and 2014). She has a variety of teaching and research interests, including early childhood curriculum and pedagogy, philosophy of education, early childhood politics and policy, childhood studies, and theories of narrative identity. E. Jayne White is an Associate Professor in the Faculty of Education at the University of Waikato, New Zealand, where she is co-director of the Visual Lab and a member of the Early Years Research Centre. Her pedagogical and philosophical work focuses on the complex processes and practices of meaning-making in contemporary 'open' societies. At the heart of her practice lies a strong emphasis on dialogic pedagogy, and the ways in which teachers can best engage within complex learning relationships – with a particular emphasis on the earliest years and ‘the work of the eye’. She is co-editor of the recently launched Video Journal of Education and Pedagogy, associate editor of the International Journal of Early Childhood, and reviews for several other journals, including Educational Philosophy and Theory. Her latest book is Introducing Dialogic Pedagogy: Provocations for the Early Years (Routledge, 2016).